Images used in this video can be downloaded in the Resources Section of the site. The cycles of celestial bodies, particularly the Sun, form the basis of the Maya calendar. It is no coincidence then that the word for Sun, day, and time are the same, or are very similar to each other in all Mayan languages. 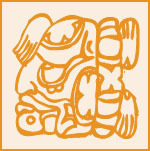 To keep track of time, the Maya observed and recorded the yearly cycles of the Sun; including the times of equinoxes, solstices, and the zenith and nadir passages. Sunlight and shadows, as well as the position of the Sun during sunrise and sunset, are recorded in the architecture of the magnificent pyramids, palaces, and other structures of ancient Maya cities to this day. These special times of the year were celebrated with pomp and ceremony in ancient times; and, today, thousands of people, both Maya and non-Maya, visit archaeological sites and witness the relationship between the Sun and the structures of these monumental cities.